Fadi Shamlawi has to pay 6,000 NIS for briefly crossing the median line on a highway in the West Bank. Fadi was on his way home to Hares from a job interview in Jericho earlier this week, when he was pulled over by Israeli police for a minor traffic infraction – momentarily crossing the centre line of a highway shared by Palestinians and illegal settlers. While one may reasonably expect a verbal warning or small fine for such a minor violation, that wasn’t the case. 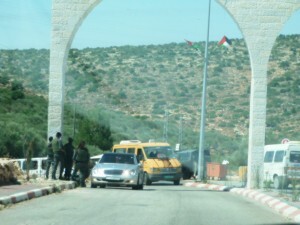 Instead, Fadi was arrested and taken to a police station in Ari’el settlement, where he was detained for several hours. In addition, both his vehicle and his drivers permit were impounded, meaning that he has neither the right nor the means for transportation, until his possessions are released in a month’s time. In addition to detention and deprival of property, Fadi is facing a day in court, 2500 NIS fine, 1000 NIS in legal fees, 50 NIS per day to pay for the expense of having his car stored in the impound lot, and 1000 NIS in fees for transporting his car to and from the impound lot. The numbers could go up if the Israeli military courts decide to delay his court date, or hold his property longer than the designated 30 days. Exorbitant punishments for traffic violations are routine treatment for Palestinians at the hands of the Israeli military administration. Fines, loss of permits, and loss of vehicles are nothing new. Sometimes the consequences are more drastic. Yesterday, Anwar al-Salaymeh, 22, was killed by the Israeli military in al-Ram, and his friend Fares al-Rishq was critically injured after soldiers opened fire on al-Rishq’s car for speeding. An unnamed bystander was also killed, and two others sustained minor injuries. The treatment that Palestinians face in these situations is the definition of disproportionate force. For those like Fadi, who are trying to find work in a territory with high unemployment rates, the financial burden and deprivation of transportation can be devastating. For Anwar and Fares, the consequences were even higher.